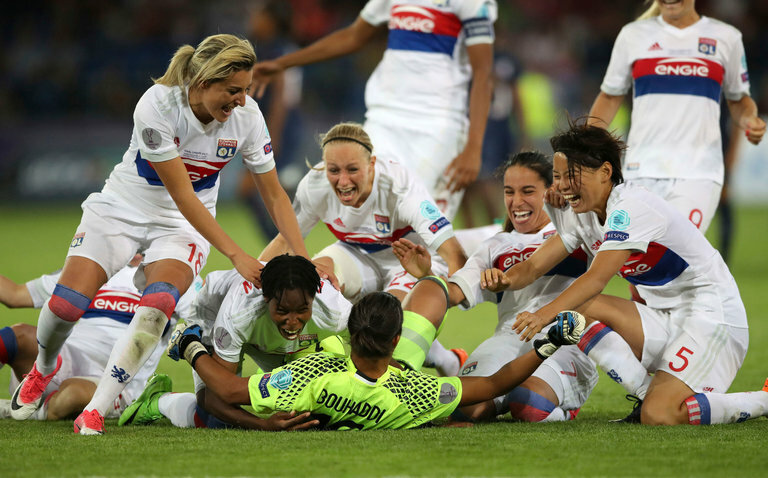 Lyon players rushed goalkeeper Sarah Bouhaddi after her winning penalty kick. CARDIFF, Wales — Sarah Bouhaddi found herself an unusual but crucial role for Lyon in the Champions League final against Paris St.-Germain on Thursday: goal scorer, instead of shot stopper. Bouhaddi, Lyon’s goalkeeper, scored in a penalty shootout victory over P.S.G. to clinch a fourth Champions League final for her club, tying the tournament record. After the all-French European final ended 0-0 following extra time, Lyon and P.S.G. went back and forth on penalties, which extended into sudden death. With the shootout tied at 6-6, P.S.G. goalkeeper Katarzyna Kiedrzynek missed from the spot. Bouhaddi, who had already made one penalty save, stepped up for the next kick and made no mistake.